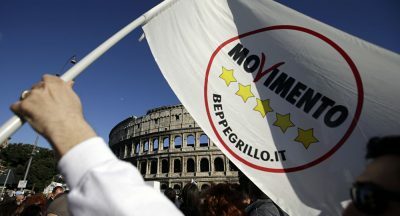 In a stunning repudiation of both their national political establishment and the European Union, Italians handed two Euroskeptic parties, the Five Star Movement (Movimento Cinque Stelle, M5S) and the League (Lega), a majority of votes in elections held on March 4. The result, which Euronews called “a big shock [to the EU]” and an “earth- quake,” comes two years after Britain’s exit from the EU, to which the Italian vote is being compared. 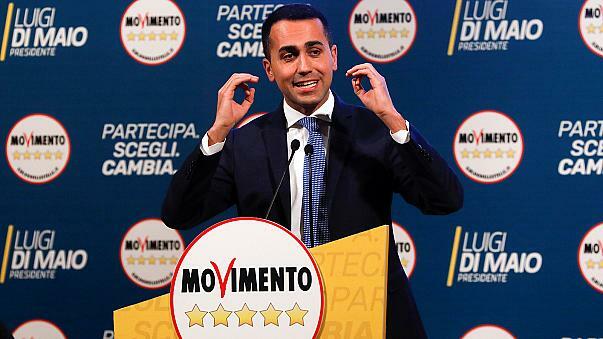 The populist M5S, led by 31-year-old Luigi di Maio, won 32.7% of the vote (up from 25% in the 2013 election), making it the most popular party in Italy, while the neofascist League got 18% (up from 4% in 2013). Both parties drew support by criticizing the EU’s imposition of economic austerity on Italy and calling for a referendum on the country’s membership in the union. (Both have also since softened their positions on the EU.) But neither the League nor M5S won the 40% of the vote required to form a majority in the Italian parliament, and it was unclear, as the Monitor went to print, whether a coalition would be formed or a new election date set. The League is part of the centre-right coalition created by three-time prime minister Silvio Berlusconi and his Forza Italia (Go Italy) party. That coalition also includes Fratelli d’Italia (Brothers of Italy), another neofascist party but a relatively newer one with roots in the far-right, post–Second World War Italian Social Movement. The Brothers got 4.3% of the vote and the centre-right coalition altogether took 37%. Berlusconi himself is banned from holding political office due to a fraud conviction. “The election result was an un- precedented defeat for the Italian pro-European forces,” says Dario Quattromani, professor of political science at Roma Tre University in Rome. He includes the former ruling centre-left Democratic Party (PD) of Matteo Renzi (who resigned as leader after his party’s clobbering at the polls) and Berlusconi’s Forza Italia in that category. Italians blame the country’s massive unemployment rate ( just under 11% in early April, but around 32% for youth) and poverty in part on budget cuts enforced by an austerity-obsessed EU. Italy’s statistics office estimated 4.7 million Italians (8% of the popula- tion) lived in absolute poverty in 2016, with most of them concentrated in the south of the country. Another 30% of Italians are at risk of poverty. It’s not surprising, in this economic context, that M5S’s election guarantee of a monthly basic income for the poor and unemployed met with resounding approval in Italy’s south, which is poorer than the north and middle of the country, where most industry is concentrated. The M5S won almost all its votes in the south whereas the League attracted the support of richer northern Italians with its promise of a flat tax on income. The issue of immigration was a politi- cal boon for the League, whose leader and candidates exploited public fears, notably of unemployment, to the max. About 600,000 migrants, most of them from Libya, have entered Italy in the past five years. Since, under EU rules, migrants to the continent must be processed in their country of arrival, the issue provided more fire, alongside austerity fatigue, for the anti-EU vote. Matteo Salvini, the League’s leader, has vowed to raze Roma camps and claims that Italian society is threatened by Islam. Even more reprehensible is Salvini’s remark that Italy needs a “mass cleansing, street by street, neighborhood by neighborhood.” When earlier this year a right-wing terrorist shot and injured six African migrants in a drive-by shooting in the town of Macerata in central Italy, the poli- tician blamed the victims. Meanwhile, Salvini has praised how things were run under Mussolini’s dictatorship. The Five Star Movement combines leftist and rightist positions. Like the League, it is anti-immigrant and calls for deportations, but its leaders are less strident on the issue and more critical of European and U.S. imperialism, which they blame for the exodus. Instead, the EU chose to give Turkey €6 billion ($9.4 billion) to stop immigrants from coming to Europe. This situation provided the Italian neofascists with a crucial issue to exploit, raising them from marginal status to national powerbrokers in Italy and beyond. The collapse or marked decline of the centre-left in Italy and the rise of anti-establishment and right-wing parties follows a European trend, as seen in recent elections in Germany, France and the Netherlands. But, according to Hallinan, this does not indicate that European voters are necessarily moving to the right. “When center-left parties embraced socially progressive policies, voters supported them,” he points out. In Portugal, two leftist parties formed a coalition with the Social Demo- crats to lower the jobless rate and end many of the austerity measures enforced on the country by the EU. In recent local elections, voters gave them “a ringing endorsement,” Hallinan notes. Jeremy Corbyn took the British Labour Party to the left with a program to renationalize railroads, water, energy and the postal service, improving Labour’s polling numbers in the process (the party has been neck-and-neck with the Conservatives for over a year). Polls also show public approval of Labour’s plan to support green energy, enhance the National Health Service, and fund education and public works. Could the Potere al Popolo party (Power to the People) fit that description? The PaP took 0.95% of the votes in the March election — not enough for a seat in parliament, but a promising start, according to the party’s 37-year-old spokes- person, Viola Carofalo. Potere al Popolo was launched three months before the election as an anti-capitalist, communist, socialist, feminist and pro-immigrant party, and draws much of its support from young voters, mainly in the south of Italy. “What we desperately need in Italy is a political renewal, and this necessarily means a politics led by the young, by women, by people of colour, by diversely abled people, by people who are in politics because they believe in change and not because it has become a career,” Carofalo told Jacobin magazine in March. Accused by some of splitting the left vote, Carofalo claims her party’s priority is not, primarily, elections, “but rather getting people to participate in politics and in rebuilding communities, in rebuilding solidarity within our society.” She says Potere al Popolo is making links with similar groups across Europe, including France Insoumise and Podemos (in Spain), who are seizing power back from “career politicians,” including those on the traditional left. The message may sound as populist as anything the League or M5S put out, but, as they say, “When in Rome….” Carofalo and other European progressives are struggling to grasp the enormity of the challenge at hand. Rather than mourning the “death of liberal democracy,” as so many mainstream columnists have been of late, these new left leaders are engaged in the hard work of building solidarity across classes, generations and cultures. This article was also published by The Canadian Centre for Policy Alternatives. Asad Ismi covers international affairs for the CCPA Monitor where this article was originally published. He has written extensively on Asian geopolitics. For his publications visit www.asadismi.info. Asad Ismi is a frequent contributor to Global Research.